We’d love your help. Let us know what’s wrong with this preview of Never Too Late by A. Destiny. Abbey couldn’t be more excited. The end of the school year is coming, as is the annual sophomore class renaissance faire…and the headlining theatrical performance, where Abbey will be starring as a lead. There’s only one problem: her cos Can acting in love lead to the real thing? This standalone addition to the Flirt series, now with a new cover, is sweet, fresh, and clean. To ask other readers questions about Never Too Late, please sign up. This book lacks any kind of depth, meat or substance. Or, maybe it's just too immature for my tastes? It really is just typical, formulaic and boring. It also takes some elements of Pride & Prejudice, where the guy says something mean about not wanting to dance with the girl and of course misunderstandings and pride-filled angry events ensue. There really isn't much to commend this book. Abbey is the kind of heroine that only thinks about the hero. Literally, even before she starts to like him every other thought is Jason. I honestly cannot abide this kind of heroine. She's the lead in the play, but cannot enjoy it, because Jason is the other lead. She plays the violin, but it's seriously just a sort of drop in to give her some character, but is never really utilized, but oh guess what? Jason's an awesome bass player. Never mind that Abbey has been playing her instrument since the 4th grade and Jason just picked up the bass for "fun" a year before. It's these kinds of set ups that really hurt books like NEVER TOO LATE. Where the guy is this shining god of perfection and the girl's job is to look up at him with bright and shiny eyes and sigh dreamily. Never mind the fact that Abbey has a best friend whose only purpose is to be the obstacle in Abbey's way to getting the guy. It's supposed to be like "I'm conflicted, because my BFF likes you too," but there is no conflict, because if Abbey and Olivia are best friends there is no real sign of it. Their relationship is just like that kid you sit with at lunch, because you don't know anyone else at school. I can't even say very much good for this book besides that it is a very short read. Read it in about three hours. That unfortunately does not improve the fact that the tension is juvenile, the dialogue is the complete opposite of authentic. Point me to the person who speaks like these characters, never mind teenagers! When people sit to write these books, do they even talk or listen to teenagers or do they just throw words together and say to themselves "this is legit?" I liked this story, it was really cute. When i first picked up this book i thought it would be very plain but soon i was immersed into Abbey's world and i finished the entire book in one day. By reading Abbey's story we don't see only the romance between her and Jason but we also learn about true friendship since we see the struggles that Abby and her best friend Olivia face when they discover that they both like the same guy. A nice read, perfect to set your mood for Valentine's Day. Wanting a quick but HEA read, I thought I give this book a try. It no doubt, gave me what I wanted. Plot: This is about a girl who held a grudge for far too long on a long time crush. I like that this plot is what it is. A cute read that gives the reader that HEA feeling. I like the little non-sense drama and even the hard to get act. If anything, I settled in for a read that is good. Love: Of course Abbey is smart girl and sticks to her passion. It takes her a while to finally see Jason for who h Wanting a quick but HEA read, I thought I give this book a try. It no doubt, gave me what I wanted. Love: Of course Abbey is smart girl and sticks to her passion. It takes her a while to finally see Jason for who he really is. She bases him on the past and that makes it hard for her to forgive him. Jason is a great guy. Even though he knew why Abbey was being the way she is being he still was patient with her and waited. He didn’t push but instead, gave Abbey what she wanted. Which ironically, only made her want him more. Ending: It has a HEA. That’s okay, sometimes as constant readers we want that Happily Ever After. I like the way it ended with Abbey and Jason finally admitting their feelings. I can close the book and feel great! Overall, this is a cute, fun read. It has plenty of teenage drama with the perfect amount of romance to make you roll your eyes. LOL. It’s a great story. I just learned that their is a companion to this story, so I will be reading the first book. Never Too Late is the perfect spring read for those looking for some love in the air. A simple High School romance. Straight forward, just what you expect in plot and characters. This was a quick and predictable read, but I enjoyed it. A nice cute and fluffy fix. The thing that actually freaked me out- the extremely quick use of the L word. I mean it was down right scary! The L word is a scary thing for a comito-phobe to deal with, but in such liberal doses, without though? Horror! A sweet entertaining book about not holding a grutch and that first impressions could be deciving, th A simple High School romance. Straight forward, just what you expect in plot and characters. Great story, filled with love, fun and friendship. i thought this book would be cuter and fluffier but it went from not liking eachother to love in like no time? when there was no connection at all between the beginning to the end. cute idea for a story but if it were longer im sure it wouldve been better. If I were to describe this book in two words, I guess nice and cute would be it. I know this book is going to be a nice and cutesy read, the blurb gave me that kind of vibe. And I guess it didn’t stir away from it. It was predictable; but all things considered, I guess I enjoyed the short entertainment it provided. Abby landed the main role in a play. She was so happy about it until she found out who she was paired up with—Jason Hardy. He did something with her that she couldn’t forget (which I’m If I were to describe this book in two words, I guess nice and cute would be it. I know this book is going to be a nice and cutesy read, the blurb gave me that kind of vibe. And I guess it didn’t stir away from it. It was predictable; but all things considered, I guess I enjoyed the short entertainment it provided. Abby landed the main role in a play. She was so happy about it until she found out who she was paired up with—Jason Hardy. He did something with her that she couldn’t forget (which I’m going to explain later how measly and juvenile it was...at least for me). Still decided, she went along but tried hard to avoid him as much as possible, until he noticed it and confronted her with it. She then told her about it and decided to call a truce. And since she was spending more time with him, the more she realized that she, too, has judged him based on the little incident before. And to make things more complicated, she was now falling for him. With the play coming along, and with her friend crushing on him, there’s so much on Abby’s plate right now. This book reads too juvenile to me. But at the same it was refreshing moment for me considering NA and YA books I read tend to be angsty in nature. This one, is just too nice, a bit trivial even, compare to the typical Contemporary books I read. Nonetheless, it was still fun. I was really wondering what Jason did to her that earn her disgust on him. When I found out I was little shocked and laughed a little. I mean, I’ll be offended, yes, since he knew nothing about me. He was basically being presumptuous on top of maligning me from others. But I won’t hold it against him for a long time. It’s not worth harboring such negative feelings towards a person, who in return I know nothing about. But they’re kids so I let her get away with it. I don’t remember anything memorable. Oh maybe, the almost kiss in the actual play and her confession to him was cute but that’s about it. It’s predictable in the sense that just by reading the summary you can formulate your expectation and quite surely you will hit it on the mark. That’s exactly what has happened to me. But even though it wasn’t all impressive and little childish for me (considering the target market for this, it is indeed not for me, haha) I still enjoyed it. It was nice and cute and I mean in a very positive way. I received an advance copy from the publisher in exchange for an honest review. Thank you. Just the book this girl needed. A dramatic chick flick with no real substance. Quick, clean easy-read.....the storyline has been done before but some unique flair was added to it. High school students Abbey and Olivia are best friends. They are excited as the school year is getting close to the end and that means the Sophomore Renaissance Faire. It is a big deal for their class and there is a competition to out do the class from the year before. Abbey auditioned for the play and she really wants the part. The only thing that could ruin her day is Jason. He is in a few of her classes and he is a class A jerk. She hates him. He said some horrible things about her last year and he doesn’t even know her. She knows what he is like under that fake friendliness. Unfortunately Olivia has the biggest crush on him and he is one thing they disagree on. When Faire assignments are announced, Abbey is ecstatic that she got the lead part in the play. Her excitement is short lived when she finds out that Jason got the male lead. She has no idea if she is going to be able to pull this off. She is determined to put her personal feelings aside and act her tail off. This play is her chance to show what she can do. She tries to keep her distance when it comes to Jason. She wants to continue hating him, but she starts seeing more sides to him. She discovers that there is more to him than she thought and she likes what she sees. Her feelings for him start to change and grow stronger. So does her guilt. She doesn’t want to hurt Olivia so she fights her feelings. The longer Jason and Abbey spend together getting to know each other, the harder it becomes for her to fight how she is feeling. She has to admit to herself what is going on and hope no one else can tell. Unfortunately everything falls apart. This was a sweet YA story. It was fun to watch Jason win Abbey over. She was very stubborn about holding on to her hurt and anger. Then as things changed, it was refreshing to watch Abbey question herself and be unsure of her self. It was cool to see real adolescent actions and feelings presented by the author. She did a great job of showing the drama that unfolded among Abbey and her friends. It was realistic and easily relatable. This story could happen at any high school. I give it a 4 out of 5. Never Too Late is one of those stories that tackle about falling in love for the first time. Together with this is all the sparks, jitters, excitement and of course the uncertainty of it all. It was your typical high school story with all the best friends, jealousy and immaturity but nonetheless fun and sweet love. Abbey our heroine is excited to end her sophomore year with a bang. No other way to go through this than to earn the lead role for the play they’re going to do for the Renaissance fair Never Too Late is one of those stories that tackle about falling in love for the first time. Together with this is all the sparks, jitters, excitement and of course the uncertainty of it all. It was your typical high school story with all the best friends, jealousy and immaturity but nonetheless fun and sweet love. Abbey our heroine is excited to end her sophomore year with a bang. No other way to go through this than to earn the lead role for the play they’re going to do for the Renaissance faire however her co-star wasn’t the one she wanted to spend a lot of time with ending her sophie year. Abbey was an okay character as your typical heroine is. She’s stubborn and I like how she values her friendship with Olivia. Jason was a jerk, arrogant and full of himself - that is what Abbey thought about him. But all of that was washed away with how he interacted with our girl through the course of the story. I ended up liking this guy more. He's sweet, yes he did say harsh things in the past but he surely did make up for it. While fighting away her feelings for her lead star, Abbey was faced with another mantra for her best friend Olivia was also crushing on Jason. The thing that happened between Abbey and Jason was so typical of any young adult story but I don’t know why but I still enjoy these types of read from time to time. The concept of the whole story was not the most original and exceptional; it doesn’t have the depth and much drama but given the age gap of the characters, you really don’t need to expect more from it for it was a simple story. The writing was catchy and the characters are okay. In all, it was cute and enjoyable. I like from time to time to read a really sweet and cute read and Never Too Late brought me just that. Everything was sort of predictable but it was entertaining to read. The book follows Abbey and her and everyone in her class is super excited for this renaissance faire they're supposed to do. She gets even more excited when she gets cast for the lead role in a play they're going to be doing in the faire. Only thing she's not so excited about? Her costar. Abbey hates him for things he has said in the past but as she starts spending time with him she starts to notice the good sides of him. The drama in this book is the one that you would expect for the age of the characters and if I'm not mistaken I think they're in tenth grade. So don't go into this one expecting some huge dramatic drama because like I said this was just a cute and light read. I liked Jackson, its nice when a character turns out to be the opposite as to what out protagonist tells us about him in the beginning. I'm not going to say much about him because I want you to see it for yourself but I'm going to say that he was my favorite character in the book! To conclude, I liked Never Too Late, it was such a cute read! I didn't think it was amazing but it is a good read and I really liked the writing style, its the type that keeps you reading. If you are looking for a light and fluffy high school romance then this is the definitely your read! I received this novel as an eARC through Edelweiss in exchange for my honest review. THis was a typical high school romance novel complete with the immaturity level and jealousy level that high schoolers go through. Abbey was an okay character. She worried too much about hurting her friend than actually being honest with her in the first place. She was very stubborn and living in the past before she realized that she had misplaced feelings about Jason. I did like Jason though. He was very sweet, I received this novel as an eARC through Edelweiss in exchange for my honest review. I did like Jason though. He was very sweet, especially to his younger brother. And Jason may have given Abbey whiplash on his feelings, but she did the same thing to him, so it was a love match made in heaven. I'm conflicted about this novel. On the one hand, it does replicate high school down to the T (although the Renaissance faire seemed a bit much, but some high schools get into the arts more than others). At the same time, I found a lot of it annoying. Maybe I'm finally getting past the whole high school drama, but that doesn't mean that I will stop reading YA novels! Never Too Late looked like a fun read and I was really in the mood for one of those. I quickly came to realize though that Never Too Late was not the book for me. This is going to be a really short review because I didn’t make it very far into Never Too Late. Never Too Late will appeal to a younger crowd. It’s a simple story with a very simple writing style. A little too simple, if you ask me. There was nothing special about the story, the characters, the writing, or the romance. I kept wanting s Never Too Late looked like a fun read and I was really in the mood for one of those. I quickly came to realize though that Never Too Late was not the book for me. This is going to be a really short review because I didn’t make it very far into Never Too Late. Never Too Late will appeal to a younger crowd. It’s a simple story with a very simple writing style. A little too simple, if you ask me. There was nothing special about the story, the characters, the writing, or the romance. I kept wanting something to happen that would keep me interested but nothing ever did. The characters were also really immature. Abbey hates Jason for some really dumb reason that I can’t even remember. When they both get the romantic leads in a play, Abbey can barely move past her hatred to work with them. Then of course she starts to see another side of Jason but this is only after she finds out that her best friend likes Jason. There is nothing but immature drama all throughout this book and I just had to stop reading. This book has no pretensions about being a literary masterpiece, and for what it is, it's enjoyable. I think I'd give it 2.5 stars. The plot is not particularly original, and what causes me to dock the most stars is that the writing is not particularly polished--commas in wrong places, some language that feels gimmicky ("superfun", etc. ), occasional incorrect grammar or usage. There's a lot of melodrama typical for kind of story: immediately assuming bad things about someone who likes the same gu This book has no pretensions about being a literary masterpiece, and for what it is, it's enjoyable. I think I'd give it 2.5 stars. The plot is not particularly original, and what causes me to dock the most stars is that the writing is not particularly polished--commas in wrong places, some language that feels gimmicky ("superfun", etc. ), occasional incorrect grammar or usage. There's a lot of melodrama typical for kind of story: immediately assuming bad things about someone who likes the same guy you do, or over-emphasizing that everyone likes this guy. Everyone. Abbey's cast in the school play opposite Jason, a boy who badly hurt her feelings in the past. The more they get to know one another, the more sparks fly, and they realize just how wrong first impressions can be. 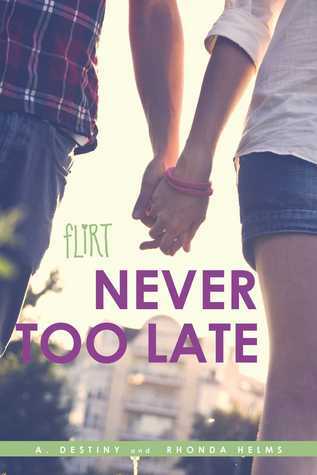 Never Too Late is a quick, warm read, with an ultimately positive female friendship, strong family bonds, and chemistry that shifts from antagonistic to sweet without seeming forced. This isn't the most complicated or complex story ever told; sometimes all you need for entertainment value Abbey's cast in the school play opposite Jason, a boy who badly hurt her feelings in the past. The more they get to know one another, the more sparks fly, and they realize just how wrong first impressions can be. There's young adult and then there's *young* adult. This one was too immature for me and I just couldn't connect with the characters. Side note: the formatting was really screwed up on my iPad and that made it even more difficult to read. I made it to the 30% point before I gave up. I won't be finishing it, rating it or reviewing it. I'm sure many younger readers would love this book. It just wasn't for me. Sometimes you just want a fun fluffy read. It was very cute overall but at times I swear some of the things the characters said were not something a typical high schooler would say. I loved the Renaissance faire, that was by fair my favourite aspect of this book. I wanted more faire though. Wish I could have known what some of the other booths were. Can't lie I'd always wanted to go to one so that's why I probably enjoyed it the most. 3.5 stars - This was a cute, young adult chick-lit if you're looking for a quick read. It was a very simple, straight-through type of book, with typical characters who act exactly how you would think they would have acted. I think those who want a short, light-hearted, not-to-complicated story about a young high school couple who learn that you can't always hold a grudge a person based on first-impressions would enjoy this book very much. This book was so good. I loved it so much. I could have read this in a day, but it took me 5 days to read it because I wanted it to last. I will be reading the other books in the series. I can't wait! OMG I loved this book! The back and forth between Abbey and Jason is perfect, as is the conflict with her best friend. Not to give anything away, but I reread the last couple pages at least four times. Swoon! Abbey gets the lead in the sophomore class play. Jason, her nemesis, gets the male lead in the play. This is complicated by Abbey's best friend, Olivia, who has a crush on Jason. There is nothing new in this plot, but it is a light beach read for teen girls. This was really good! Loved the plot, and the characters, but the only thing I didn't like about it was how quickly the story was resolved. It only took 4 or 5 pages! Another great ready bout two young adults who discover love. Great read for young adults. Really simple highschool romance, with a simple way of telling the story. Plain and simple. Did I say simple? Oh yeah I did. This was a cute story. Nothing to showy or too deep but completely cute and perfect for a summer beach read.